Home > News > Product Knowledge > How to Adjust the Size of the Product Granularity of Jaw Crusher? How to Adjust the Size of the Product Granularity of Jaw Crusher? All customers want to buy a high quality crusher, how to determine a jaw crusher for high quality crusher? One of the important points is that the larger the crushing ratio, the better. Reduce the cost of infrastructure and maintenance, maintenance and management. The crushing ratio is one of the factors influencing the quality of the crusher. The crushing ratio of the crusher is the ratio of raw material granularity to product granularity after crushing. 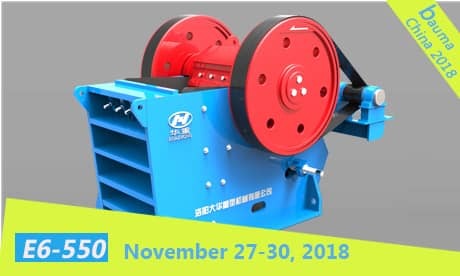 It represents the degree of reduction of raw materials after crushing, when the material is broken, the size of the material is certain, the smaller the particle size of the product, the greater the crushing ratio of this jaw crusher. In order to make the size of the product small, it is necessary to adjust the size of the jaw crusher outlet. There are three ways to adjust the discharge port of the jaw crusher. The first type and gasket adjustment: open the adjustment seat with the top bolt, and check or remove the back wall support and the rear wall of the frame. Set of spacers of equal thickness. By increasing or decreasing the number of shim layers, the discharge opening of the crusher is reduced or increased. The second type, hydraulic adjustment: the rear thrust plate is used as a safety device for the crusher. The jaw crusher uses a hydraulic safety device. It is reliable and safe, and easy to discharge faults. The third type, the support device adjustment: refers to the bearing part of the jaw crusher, generally adopts the sliding bearing cast with Babbitt alloy, which can withstand large impact load, and is more wear-resistant, but the transfer efficiency is low. Forced lubrication is required. Jaw crushers are also divided into large jaw crushers and small jaw crushers. The adjustment mode of the two jaw crushers is different. The large jaw crusher adopts hydraulic adjustment mode, which can be adjusted by non-manpower. Small jaw crushers are relatively small, and are usually adjusted by gasket adjustment or support device. If the force is insufficient, the jack can be used.